A pond really makes atmosphere in your garden. If you want to build a pond , you should consider a certain number of things, including the kind of pond, the place where the pond should be built and the cost involved. There very many different kinds or types of ponds. Do you want fish in your pond or not. Perhaps you want just plants. Did you realize that, if you want a koi pond, you can not put any plants in it? Koi will eat all the plants. Building your pond always starts on paper or at your PC. You design a plan of your garden, on which you get started, using cut out models in different shapes and sizes. Of course you can also do this at your computer. The design and measurements of your pond should fit in with the remaining part of your garden. It will form a logical whole with it. You want to emphasize the character of the garden and the pond. If you think you have found the right design, you plot the form chosen with small sticks and a rope or with a flexible hose in your garden. Doing this, it is wise to carefully watch the actions of light and shadow in the garden. Water plants do require much sunlight, at least six hours a day and fish think a little warmth agreeable. So, preferably a place with some sun and not too much under trees. Also look whether you can see the place from your house. You should also remember the necessary electricity cables for connections of pond equipment and pond lighting. 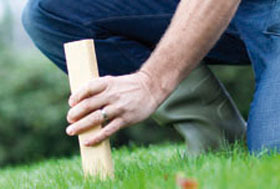 Also check if there is any piping that was maybe laid before in your garden. For example, sewers for sewage or rain-water. 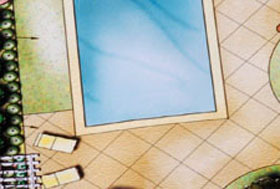 Also check for the presence of annoying reflections by putting a large mirror on the future place of the pond. The reflection of air or plants will look somewhat more friendly than that of an awful fence. A pond should also be safe, especially if little children are involved. View on the pond from the house is important then. Besides that view will provide a beautiful picture! The profile of the pond decides how plants will look later above the water line. Therefore the underwater structure should comprise marked off areas at different depths, where water plants you have chosen will settle down best. Create special shallow areas in your pond for marsh and littoral plants. Preformed ponds have a custom-made profile with different depths for water plants. Fish want to have space and need a deep water area in order to live through winter. The more water, the more simply a biological equilibrium will form. Ponds having a surface area ranging between 2 and 6 yd2 should have a depth of at least 28 inches. If the size ranges between 5 and 12 yd2 this depth should be added by at least 12 inches. In case of still larger ponds it is wise to continue digging until 60 inches. If you adhere less to a design of your own, you might consider to purchase a preformed pond. It can be simply placed. It will fit noticeably well in a formally designed garden and it can be easily moved along with your other property. For a liner pond you will keep all freedom in the design. 3D pond liner is quite popular. 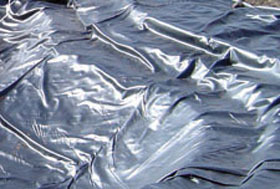 It is a bag from EPDM pond liner which is custom-made according to the size form of the pond desired. This implies that you need not remove any pleats or cut the pond liner itself to size and glue it. The only thing you need for it are the measurements of the pond. If you use pond liner you fix the side using a drain pipe and for the remaining finish you use a suitable material, for example peat. Boulders or natural stone are also an excellent solution. For a complete green transition you opt for an overgrowing mat provided with water plants. For any questions about the building and maintenance of a pond you can always apply to the professionals in garden centres and specialist shops. They will be pleased to give you advice and will give concrete answers. What will the building of a pond cost ? The cost of building a pond depend on a number of factors. The size of the pond, the necessary technique, fish, plants etc. A small pond, up to about 1000 litres will easily coast 180 GBP or 300 US$. A large one with koi will easily cost some tens of thousands of GPB or US$.